The auctions in Geneva that occur in November are one of the highlights of the year for the fancy color diamond world, and this year is no exception with the Sky Blue Diamond. Sotheby’s has officially announced their lineup of beautiful diamonds and diamond jewelry, and as expected, has included some impressive fancy color diamonds on the list. The standouts are the headliner, the Sky Blue Diamond, and two pink diamonds. Generally speaking, the auction houses reserve the most spectacular gems of the year for the Geneva auctions because these auctions have long ago acquired a reputation for monumental pieces making big headlines in the news for record breaking prices. 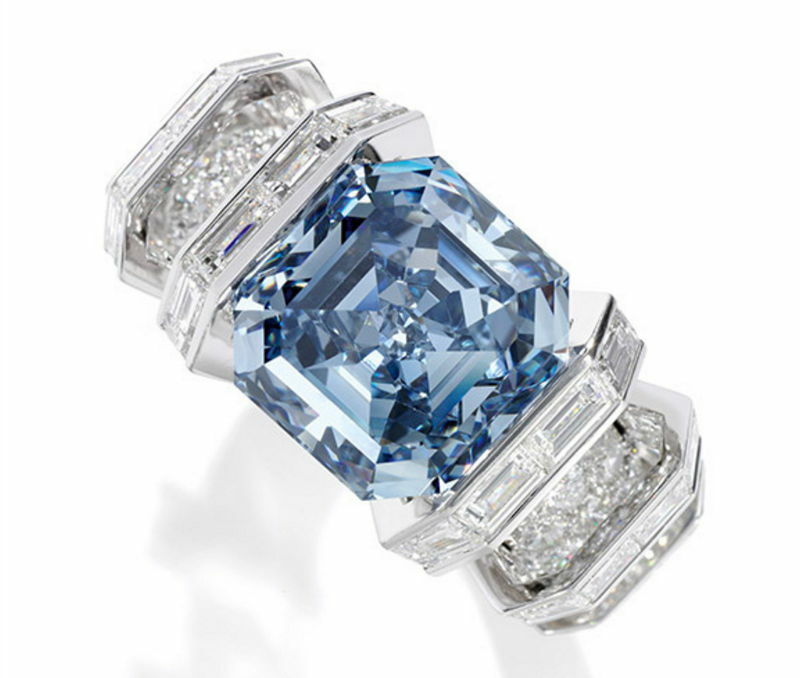 The most exciting piece of the night is the Sky Blue Diamond, an 8.01 carat Fancy Vivid Blue Type IIb square shaped emerald cut diamond ring by Cartier. The auction house estimates that the diamond will sell for $25 million, following in the footsteps of blue diamonds of previous years. Just last year, the Blue Moon of Josephine diamond broke all known diamond records when it sold for $28.5 million, the current highest price ever paid for a blue diamond, and the hypothetical price for the Sky Blue diamond to beat. In the words of the Sotheby’s chairman of their international jewelry division David Bennet, the Sky Blue diamond is ‘a celestial blue’ and is a very flattering cut. The next noteworthy diamond is the 17.07 carat Fancy Intense Pink VVS1 emerald cut diamond. It is estimated to sell at a price between $12 million and $15 million. Given its large size and excellent pink color, it comes as no surprise that the diamond is expected to fetch such a high price. It is a matter of course that large pink diamonds demand some of the highest prices on the market. Even though the color intensity is Intense and not Vivid, the diamond is still delightful and will perform well. The final fancy color diamond highlight of the evening is the 13.20 carat Fancy Intense Pink IF pear shaped diamond. Not only does this diamond exhibit beautiful color and shape, its competitive advantage is in its clarity relative to its size. It is very rare to find such a large diamond with such good clarity, and the Internally Flawless clarity grade will be what pushes this diamond to its $14 million estimated price. Clarity is not usually such an important factor in the valuation of fancy color diamonds, unless it is an extremely good clarity as it is in this case. Therefore, there is tremendous importance behind the IF clarity of this diamond. It is always a pleasure to see beautiful pink and blue diamonds at auction, and the ones that Sotheby’s has chosen for November 16 are truly magnificent. It remains to be seen whether diamond buyers will behave as in previous years, willing to lay down large sums of money to acquire their desired gems, or if Geneva will witness a different type of auction result this year. What do you think?